It is with a heavy heart that I write my post about this week’s recipe for French Fridays at Dorie. I’ve learned some new techniques, explored new combinations of ingredients, and experienced some new flavors. It’s been a new adventure every week. After nine months of cooking from this fabulous cookbook, this week I hit my first complete dud: the Cola and Jam Spareribs. In my house, when it comes to big slabs of meat, particularly ribs, this is normally my husband Howard’s domain. His usual treatment is a long, slow cook on his fancy Texas smoker. When I announced this week’s recipe, Howard was initially doubtful. But, over many months of my cooking from the book, he has faith in Dorie, too, so kept an open mind. We were expecting guests (my friend and two teenaged girls) so doubled the recipe and made two racks. 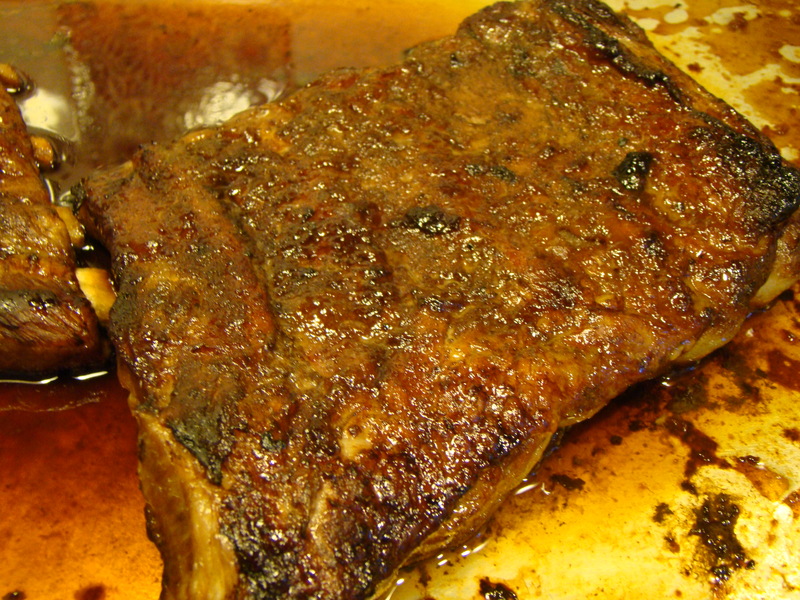 The ribs are rubbed with fragrant ginger and five-spice powder. The glaze was a mix of orange juice and apricot jam (Stonewall Kitchen’s Apricot and Ginger Jam) with a dosage of Coca-Cola for the final hour. The preparation was quite simple. The only preparation glitch was that I didn’t check with the in-house Coke drinker (Howard) and made the faulty assumption that we had cans of Coke in the basement. We were out of stock, so someone had to make an extra trip to the store while the ribs did their initial roasting. The ribs looked great as they cooked. I had to open the oven for basting, and it smelled good too. In the end, the teenagers opted out, and didn’t show up for dinner, so there were plenty of leftovers. After bringing ribs for lunch on the day after, Howard and I both sheepishly admitted to each other that we weren’t enjoying the ribs and neither of us wanted to bring them for lunch again. I ended up tossing out a full rack of spareribs. I hate wasting food, but I just couldn’t make myself eat them again. I’m really not sure whether I did something wrong or it just wasn’t to our taste. I did add water to the pan to keep things moist, but, because the pan was almost borderline dry between bastings, I can’t imagine that I added enough water that it diluted the flavors. I’ll chalk it up to “you win some, you lose some”. I’ve cooked close to 40 recipes from this book, and, as I said, this was the first loser (to me), so the odds have been favorable. I can’t wait for next week’s recipe: Roasted Rhubarb. I already know I’m the only one who will eat it at my house, but if, it comes out as I hope it will, it just means more for me. Posted on 10 June 2011, in French Fridays with Dorie and tagged French Fridays with Dorie, spareribs. Bookmark the permalink. 20 Comments. Kudos for trying these ribs and serving it to guests! I don’t think I would have had the nerve with a new recipe. I love seeing everyone’s variations! And I agree with Yummy takes a lot of confidence to try a new recipe for guests – though Dorie’s recipes are always wonderful! I feel your underwhelmingness! I almost invited fellow Dorie fans over to have the ribs with us, but didn’t. I’m glad a decided not to. They weren’t bad, but just not the huge hits other recipe have been. There’s always next week! Aw Betsy! I guess you are lucky and spoiled with great ribs from a smoker. I almost wish I could have smoked these with the Dorie marinade but was afraid that the marinade would burn off too quickly. Oh no…too bad that they didn’t work out. :( I thought about the smoker and the grill, but I followed the recipe and thankfully, it didn’t disappoint … they were pretty good. Betsy, After eating ribs done in a Texas smoker I’m sure the result was lackluster! If nothing else at least you tried them…sometimes you win…sometimes not! I thought the ribs were good but not great…they lacked a kick of flavor. Betsy, I just posted the recipe for tabbouli the other day…Hope you enjoy it! Sorry you didn’t enjoy this one! This is the first FFWD recipe I’ve been excited about in a while and was completely underwhelmed too. Sorry this one wasn’t a hit for you. I can see where the flavors would be pretty taste specific. And I guess if you are used to the results of a smoker – it would be hard to beat that! I’m sorry this didn’t turn out for you, Betsy, especially on a night that you had a dinner guest. After as many recipes that you have cooked from the book, though, I think only one disappointment is not bad at all. You’ve got a great track record with Dorie’s recipes – we’re all bound to find a few that aren’t to our taste. We enjoyed these, but we’re not traditional rib eaters. You have a better than average batting average on the recipes, and there are bound to be a few in there every now and again that just won’t make the cut. Sorry that it was disappointing! Once you’ve had steak, peanut butter just won’t do. You can’t compete with the smoker I’m afraid. These went over well in our house but then we haven’t been spoiled like you. Kudos for giving it a try! The more posts I read about this dish, the more glad I am that I totally changed up the recipe! It definitely wasn’t you – a lot of people were underwhelmed by this, it seems. Hard to beat the taste of a smoker and a house favorite!! But there are still more FFWD dishes to explore! Sorry to hear that these were not a hit for you. I think it’s the “you win some, you lose some” theory in practice. Onwards and upwards to next week! I felt exactly the same! I was skeptical but decided to trust Dorie’s recipe cos so far it’s all turned out pretty good. But I really did not like the taste. We flew out to Melbourne early the next morning so I didn’t even feel it was worth posting. My meat turned out incredibly tender, we just did not like the taste.